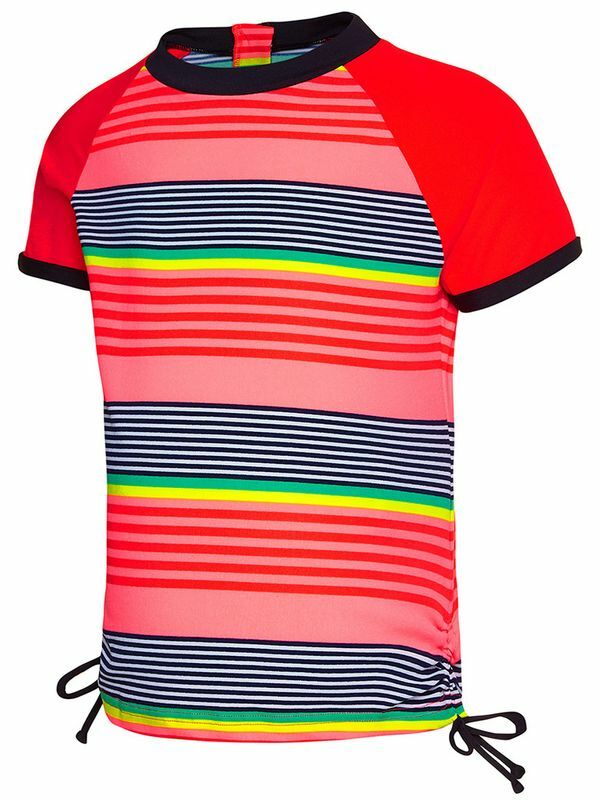 Adorable and comfortable, the Speedo Fruit Dream Sun Top is a heaven-made match for your toddler. The sleek fabric is a combination of super-soft and shape-retentive with a subtle stretch to accommodate your kiddo during mini growth-spurts. And the designs are lovely and attention-grabbing in stripes of rainbow colours with neon-pink short-sleeves. Additionally, a back-neck zipper offers adjustable comfort. And the entire tee is coated with UV-protection to protect your baby from harmful sunshine rays. Perfection? We would say so! Fruit Dream Toddler Girls Sun Top manufactured by Speedo Swimwear the worlds leading swimwear brand. Speedo is passionate about life in and around the water, creating revolutionary new technologies, designs and innovations.